Editor's note: More than a half-century after the demolition of Bulkeley Stadium, the concrete and steel are in place for a new home for professional baseball in Hartford. Here's a fresh look at the old Bulkeley Stadium, in an article that first appeared in the Connecticut Smoky Joe Wood Chapter's January 2016 newsletter. For more information, visit SmokyJoeWood.com, the Connecticut SABR Chapter's website. Morgan G. Bulkeley Stadium, named after the first president of the National League, existed on a 4-acre site at 30 Hammer Street in Hartford’s South End. It was located one block west of Franklin Avenue, near the Wethersfield town line. It continued a rich past history of baseball in Hartford. Built in 1927, Bulkeley Stadium was a single-story building with a covered grandstand extending from the right field fence to the third base area and a bleacher section extending from that area to the left field fence. Bulkeley was a concrete and steel edifice with a wood shingled roof covering the grandstand. A wooden outfield fence, with colorful advertising signs, extended between the foul poles. Seating capacity was 6,500. Grandstand seats had backs and arm rests. Bleacher seating was on plain wooden planks. For overflow space, spectators could stand facing the playing field in a roped off area in front of the outfield fence. Box seats were added in 1947. The distances from home plate to the foul poles were 315 feet to left and 310 feet to right. It was 340 feet from the plate to the center field fence. The principal use of the field was for professional baseball but other events held there included semipro and amateur baseball, football, prize fights, track and field, motorcycle races, the circus, water shows, political events and revivals. The Eastern League was the principal organization conducting pro baseball at Bulkeley. Cities fielding teams in the EL over the years included Albany, Binghamton, Bridgeport, Elmira, Hartford, Holyoke, New Haven, Norfolk, Pittsfield, Providence, Richmond, Scranton, Springfield, Utica, Wilkes-Barre, Williamsport, and Worcester. Many talented athletes played as members of Hartford teams on the Bulkeley Stadium grounds before going on to big careers in the major leagues. They include Hall of Fame members Leo Durocher, Lou Gehrig, Hank Greenberg, Paul Richards, and Warren Spahn. Also, major-league teams frequently made trips to minor-league cities for exhibition games. Among those coming to Bulkeley were the Boston Braves, Boston Red Sox, Philadelphia Athletics, Pittsburgh Pirates, and St. Louis Cardinals. Babe Ruth made a cameo appearance at Bulkeley in 1945 as a barnstorming player for the local semipro Savitt Gems — after his retirement from the major leagues. A brownstone monument commemorating the existence of Bulkeley Stadium has been placed on the stadium grounds and a replica of home plate has been placed on the exact site of home plate at the old ballpark. I hope these will exist long into the future to honor what really was a very special place. SABR member NORMAN HAUSMANN is a retired insurance executive who lives in East Granby, Connecticut. March 1928. Bulkeley Stadium begins as the existing stadium (named Clarkin Stadium) on the George Street Grounds was sold by James H. Clarkin to Robert J. Farrell and Associates in January of 1928. Following the sale, the stadium was re-christened Morgan G. Bulkeley Stadium in honor of a prominent 19th-century Hartford businessman and politician who served as the first president of the National League. April 18, 1928. First game played at Bulkeley Stadium. Harford is defeated by Bridgeport, 8-4. January 14, 1930. President Robert J. Farrell dies at age 32. Acute appendicitis is the cause. January 1931. Hartford becomes a farm team of the Brooklyn Dodgers. September 1931. Hartford wins the Eastern League pennant. June 1932. The Eastern League folds. Pro baseball leaves Hartford and Bulkeley Stadium. 1933 to 1937. Bulkeley Stadium is leased by Bill Savitt, owner of the Hartford jewelry store, Savitt Jewelers. The Savitt Gems semipro team plays at Bulkeley Stadium during this time against a variety of opponents, including exhibition games vs. major-league teams. February 1938. The Eastern League is re-formed and pro baseball returns to Bulkeley Stadium. The Hartford team becomes a farm team of the Boston Braves. This affiliation continues until the end of pro baseball in Hartford (1952). June 1941. The first permanent lighting system in Bulkeley is installed. Portable lighting systems had been used there a few times all the way back to the 1930s, but the new system brings night baseball permanently to Bulkeley Stadium. September 1944. The Hartford team, now called the Hartford senators, wins the Eastern League pennant. 1946 to 1952. The team name is the Hartford Chiefs. 1952. Eastern League attendance at Bulkeley Stadium dropped to 30,000. The Braves pulled out of Hartford at the end of the season and relocated the franchise to Jacksonville, Florida. July 7, 1955. 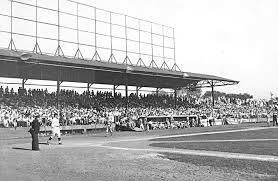 Bulkeley Stadium is sold by the Milwaukee Braves to John E. Hays Realty of Hartford for $50,000. A shopping center is planned for the site but it never materializes. Spring 1960. The stadium property is sold to enable construction of a nursing home. The Stadium structure is torn down. Demolition is complete by September of 1960. Spring 1961. The Bulkeley Convalescent Home is completed on the site of Bulkeley Stadium. This business is now known as Ellis Manor. and is owned by Affinity Healthcare, Inc. of Cheshire, Connecticut, and New York City. This page was last updated February 2, 2016 at 3:13 pm MST.